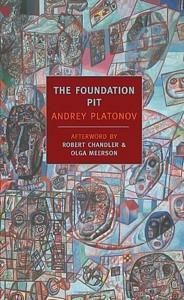 Suppressed and unpublished for many years, and only made widely available after the fall of the Soviet Union, Andrey Platonov's "THE FOUNDATION PIT" has belatedly been recognized as one of the rare works of literature to come out of the Soviet Union that illuminates its terrors most brightly. Having never heard of it, I bought it a couple of weeks ago on a lark at the amazing Green Apple Books in San Francisco after reading their "shelf talker" about it, reckoning that it might be a good edition to my 10-Books-In-Five-Years Russian literature project that I'm not doing particularly well with. The book, written in the late 1920s and early 30s as Stalin began the massive rural collectivization that came to characterize "The Great Terror" and the murderous disaster of Soviet communism, was Platonov's own cry of disillusion against what he saw as the perversion of Bolshevism that he'd fought for is his own youth. "The Foundation Pit" is a bitter parody of the ridiculous all-for-one sloganeering of communism, the "acquisition of consciousness" that was to come from hard work and the murder and exile of the land-owning "kulak" peasants who were simply tools of capitalism. The book jumps around in odd ways, and it's best to read it as a collection of anecdotes and speeches that are part of a larger tale. I personally lost track of which character was which, and as it turns out, it really doesn't matter. All of them are dupes of the Soviet consciousness-raising and of Stalin's plan for them all to brutally work themselves to the bone in order to build a new order of humanity (and many new buildings and industrial plants as well). The people of the novel, starving and subjugated by "the activist" who gives them their orders, comfort themselves with slogans and learned, forced behaviors in the "knowledge" that they're building a better world for the children of the revolution. It actually becomes quite comic, if horrific, in parts, especially when the young girl Nastya speaks about Papa Stalin and encourages men four and five times her age to murder the collective-resisting peasants in their midst. I'm certain their are metaphors all over the novel, such as the foundation pit itself that the initial group of men in the novel are digging, but I'm probably too daft to see them. It's clear that the pit, which is ultimately abandoned after months of back-breaking work to build it, becomes not a gleaming edifice for a grand building, but a pit of death in which starving people are buried. Platonov witness much of the forced collectivization firsthand, and this novel was his anguished mockery of its brutality and the inhuman treatment of man. It's also extremely downcast on the men and women swept up in Soviet propaganda; virtually everyone in the novel is a complete and utter dupe of the system, and most go to their deaths or their drudgery still mouthing ludicrous slogans of fealty to communism and a "better life". It's pretty devastating stuff - quintessentially Russian and a little bit of a cockeyed read, but definitely worth your time in order to see the horrors of Stalin's Soviet Union as witnessed by the real "common man".